In 1983 I completed my degree in Fine Art at Falmouth School of Art and travelled north to set up a studio with fellow Falmouth student Keith Barrett – now a leading name in British environmental sculpture. At the time I was pretty green behind the ears, with great ideas of ‘being an artist’. And I worked hard at my sculpture and drawing but never even considered that I needed to do more than simply make art …even if it wasn’t too bad. Needless to say, three years later and much in debt, I had to leave the p/t MA Fine Art course I was doing in Newcastle in a desperate search for work …and some kind of money. The only mitigating factor was that this was 1986 and Thatcher and her government were ransacking the country and its work force. But I couldn’t blame my failure on that …as much as I would have liked to. It was much more because I really hadn’t got the idea that for people to buy my work …they had to know it existed. It was no good sitting in a studio all day simply making art. Now, one would have thought that I would have learnt …but no, while I did all sorts of jobs, working in youth hostels, kitchens, cleaning caravans etc, I still carried on with my art …but still hidden away. As my sight started to fail in 1990, I set up another studio, this time with my partner Anita (newly qualified from a two year ceramic design course, but still we put all our efforts into the product and failed to realise we had to promote what we were doing. And again we failed …closing the studio after about three years. By the late 1990’s after a period where I’d spent all my spare time trying to re-learn how to work with rapidly diminishing sight, we moved to Scotland and I started once again to try and exhibit work. Even so I was still going down the same line, making the work but really not pushing myself. Finally though when I took on a WASPS studio on the harbourside in Irvine I took the first tentative step …I decided right from the start that I’d have my studio door ‘open’, I’d put a sign outside and invite passers by in to see the work. It wasn’t much, but people started to notice my work …and, you never quite know (even on Irvine harbour side) quite who will walk by and see your sign. In 2004 a local chap wandered into the studio and after looking at the work announced that he was an art promoter living and working in Columbia, and he said to keep in contact. Well, I still hadn’t learnt, and although I kept his card ..I never got back in touch. Thankfully, on his next visit to Scotland in 2008 …he wandered back. After a lengthy talk he suggested we work together, he talked about the need to promote myself as well as my work, a concept that rather sheepishly I was still only just grasping. We talked internet, websites, galleries, press releases …and finally the penny dropped! I still spend much of my time painting and drawing, but now I spend a lot of time on the computer, writing articles, writing this blog, visiting galleries, getting involved with various projects etc …in short, getting my name and ugly mug out there as much as possible. And it’s starting to work. The website is getting busier, people are starting to contact me; a momentum is starting to build. The latest little project is to make a short video, a sort of 4 – 5 minute advert about myself, my work and my love of the hills. 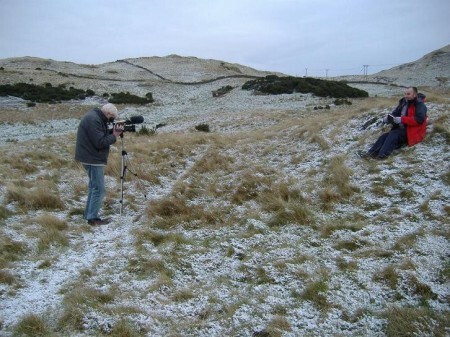 It’s been fun making it, even sat outside on a snowy hillside sketching while Jim Crossan the film man did his work. The video, partially funded by North Ayrshire Council, is nearly finished. It’s to go on my website as well as being made into quality DVDs to send out to galleries and potential customers. The point is I guess, that it doesn’t matter how good your work is; if the public don’t know it exists and they don’t know anything about the artist, then you’re really going to struggle. It’s been almost 27 years since I left Falmouth School of Art and finally I’m starting to get it right, things are starting to happen. Watch this space! >> Next Post: Back in Business! donation however small.Although art resales is our main stay,we would like to start promoting new work from scottish artists.